Starting Thursday, May 31, contractors for the NDDOT Fargo District and City of Fargo Interstate 94 (I-94) and South University Drive interchange project will close the westbound off-ramp from I-94 to South University Drive overnight from 8 p.m. – 6 a.m. Crews will close the westbound interstate off-ramp to South University Drive for the installation of sewer pipe across the ramp. Motorist will be routed to 25th Street South interchange to exit the interstate traffic and continue travel on South University Drive. The westbound I-94 off-ramp will reopen to traffic by the early morning commute on Friday, June 1. Northbound South University Drive to westbound I-94 traffic will be re-routed around the pipe installation with flaggers and no detour needed for this direction of travel. All other interstate access onto to South University from I-94 remains open for use of the traveling public. Crews will have the temporary on-ramp for eastbound I-94 traffic from South University Drive ready for motorists to use in the next week. The temporary ramp entrance will be just north of the current ramp and tie-into the existing ramp. This will allow crews to begin removals on the southeast corner of the interchange. When this work begins access from 21st Avenue S to South University Drive will be via 11th Street S to 24th Avenue S. The frontage road running parallel of South University Drive near the gas station and motel will remain open for access into the business driveways and to South University Drive. 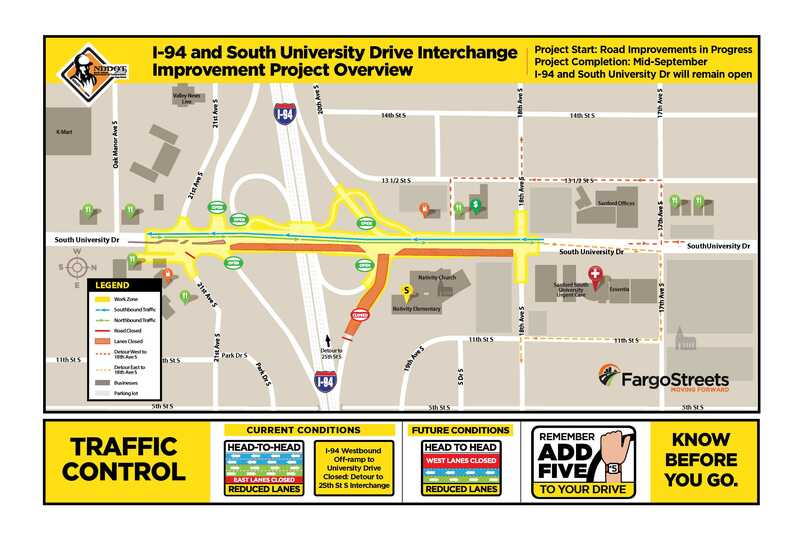 The sidewalk on the west side of South University Drive from 18th Avenue to under I-94 has closed to pedestrians with the increased amount of construction activity in the northwest interchange quadrant. The detour for pedestrians is 18th Avenue to 13th ½ Street S to the green walking bridge over the interstate. Currently two lanes of traffic are open on the west side of the roadway for both directions on the existing pavement. Crews are removing the east side of the roadway. Flaggers are present to assist with truck traffic moving in and out of the zone. Work on the east side will take about two months to complete removals, underground and paving operations. Traffic will then shift to the newly constructed east side roadway to begin the reconstruction of the west side of South University Drive and ramp improvements. Speeds are reduced to 25 mph. Motorists may experience brief delays. If an alternative route is available, motorists are encouraged to use these routes to help those traveling through or turning into driveways found in the work zone.